You can’t help but like Hilary Davidson. As a person, she’s a warm, inviting presence and like most crime writers, a stark contrast to her menacing fiction. I discovered Davidson’s writing through her Spinetingler award winning short story, “Insatiable”. The story of sexual dysfunction was one of my favorites of 2009 and I eagerly anticipated her debut novel, the Damage Done. On November 2nd, I was lucky enough to sit down with Davidson before her appearance at the Poisoned Pen in Scottsdale, AZ to discuss the Damage Done, her writing process, the Gluten Free guidebook, and her future writing projects. Hilary Davidson interviewed by Keith Rawson from Keith Rawson on Vimeo. The hardest working man in crime fic meets the sweetest gal in crime fic. What a pair. Nice one Keith. Hilary you look very comfortable talking about the book. I'm just at the beginning but enjoying it so far. Great interview, Keith. Miss Hilary is all-around lovely, but when I met her I was most impressed by her quick intelligence, her depth of knowledge, and that she's never at a loss for a well thought out answer. It's a pleasure to experience that again. these things really work, you know. I really want to read this now. Great interview, great interviewee. 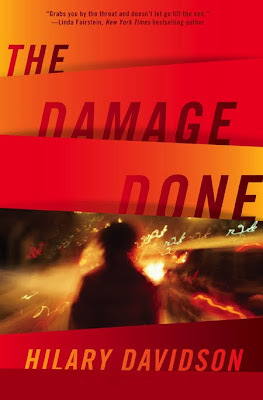 THE DAMAGE DONE is a fantastic novel, and I for one cannot wait to get my hands on the followup. Great interview! Best thing about it? Hilary's obvious love of writing (and her expert pitch for the book). Second best thing? That sultry voice of the offscreen interviewer. Good stuff. Hilary is so radiant and confident. Will be reading THE DAMAGE DONE soon. Best success on THE NEXT TO FALL so more and more books are to come. Great questions Keith. That'll teach me to check what I write first - sorry. I think that this is a brilliant series of interviews and a really worthy first over here at Day Labor. I love the way Keith makes those in front of the camera look and talk so comfortably. His voice always surprises me - I see the pictures of him looking either tough or crazy and here is the antithesis of that - soft and caring and pleasing to the ear. In this piece, there's lots to digest. Hilary has such a strong sense of her characters and the paths they chose, it's like they're living, breathing folk. Interesting comments on short/long fiction and their differences. My copy of TDD is in the post and now I can't wait for it to hit my floor. When you close your eyes, Ms. Davidson sounds a lot like Hilary Clinton with a slight Canadian accent, which raises the provocative question: do all Hilarys sound alike? Also I would have asked her if she'd be willing to be interviewed on the Howard Stern Show. Hilary is a generous interview subject. A real doll.